Rice & Noodle dish is a fun combination of ingredients all in one happy little side dish or main dish. This is quick and easy to throw together, pop in the oven, and wait. It is pretty "brown" and could use some perking up in the color department. I told my husband some green onions may have been nice on the top. We also talked about this as a main dish and what would take it to the next level. The consensus was maybe some shrimp and onions, then it would be similar to a fried rice. There is onion soup in it which adds some nice taste but the actual onions would add more texture. The water chestnuts give it a good crunch though. I would chop them up next time at least in half although I do like the presentation of the slices. Another option could be to up the amount of rice in the recipe and take out the noodles then add some peas, green beans, or carrots, then it would be more reminiscent of an easy to throw together ahead of time "fried rice". If I tried this every way I thought of I would never get to post the recipe. I will be making this again though and I'll post about it if it's that much different. 1. Preheat oven to 350F. Grease a 2-quart dish or a 9"x13" baking dish. 2. Melt butter in a skillet over medium heat. Brown the egg noodles in the butter. 3. 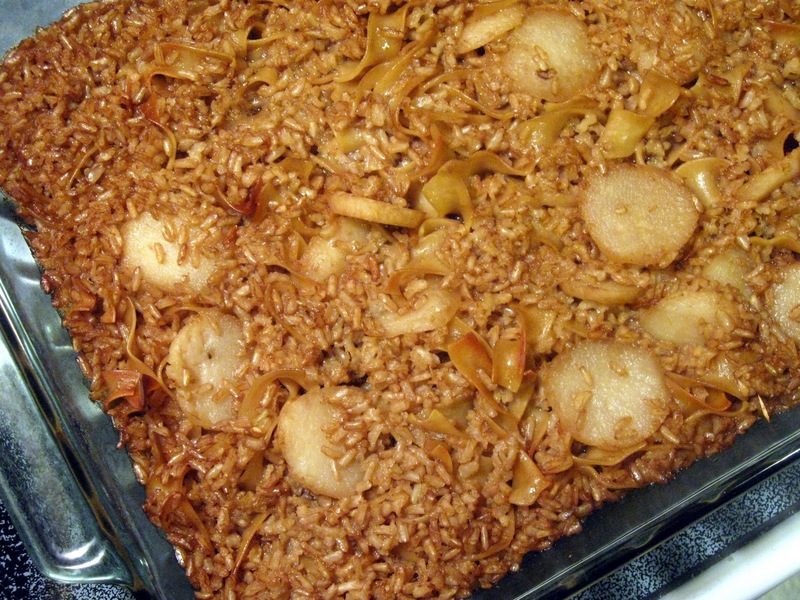 In a large bowl combine the egg noodles, brown rice, onion soup mix, vegetable broth, water chestnuts, and soy sauce. 4. Mix well, pour into prepared dish. 5. Bake for about 45 minutes or until brown and crispy on the top and the liquid has been absorbed.